Introducing Quest’s PatchLoc: A universal locking clip for RJ45 patch cords. This low-profile, nylon clip prevents the removal of patch cords. In addition, it acts as a security port blocker. Quest Technology International also offers RJ45 Plug Saver Repair Clips. They’re uniquely designed to replace the broken tab on modular plugs. 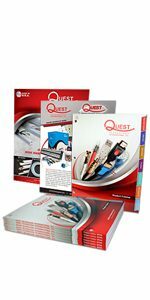 Quest Technology International presents wire management solutions to hide unsightly wires. Learn about WireHider Raceway & Raceway-On-A-Roll, the ideal choice for both professionals and DIY installers. Quest Technology now offers a new patented technology for the securing of both data and voice using standard patch cables and keystone wall plates. This innovative technology requires nothing more than Quest’s new patented locking keystone jack and proprietary security key.